OK, so you know those Law & Order episodes where the parents go berserk trying to get their toddlers into the right nursery schools, so they can get into Harvard, later? I’m pretty sure those people should also not be allowed to have pets. To get accepted at summer camp, it took a three-page application, a family interview and three hours of monitored playtime. 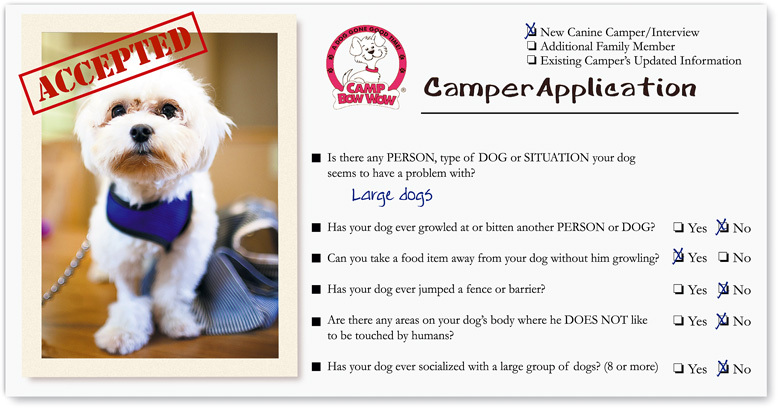 The applicant: Cannoli, a dog. Anyone who thinks elite preschools are rigorous enough may want to take a look at doggie day cares. They, too, are submitting prospective charges to exhaustive screenings. Cannoli joined a Long Island City, N.Y., doggie day care based on a three-page application, excerpt above, and an evaluation. Next was the evaluation. Owner Karen Serafinko and her son, John, watched on a TV monitor as Cannoli interacted with other dogs in a yard for dogs smaller than 10 pounds. There’s a lot to his deployment in Afghanistan that Sgt. Tim Johannsen can’t discuss. When he speaks to his stateside wife topics like where he’s stationed, his missions, and what the 23-year-old Army tanker is doing in a mountainous region where tanks can’t even travel are all taboo. But security doesn’t prevent Johannsen from talking about is his adopted dog – a loyal mutt named Leonidas, who whines outside his bunk while he’s on mission and shelters with him as mortars fall. The dog brings a touch of normalcy to an otherwise straining environment, Johannsen said in a phone interview from Afghanistan. You might remember Polo, the husky fitted with a prosthetic paw after being hit by a car, or Midnite, the miniature horse who took off running when first fitted with a prosthetic leg, but this red heeler pup takes being a bionic animal to a whole new level. Naki’o is the world’s first dog to be fitted with a complete set of four prosthetic paws, according to incrediblefeatures.com. Naki’o was barely 5 weeks old when him and his brothers and sisters were abandoned by a family fleeing their foreclosed home. Having barely survived the Nebraskan winter, all four of the dog’s paws were deformed into rounded stumps after being stuck in an icy puddle. He took to these so enthusiastically, that Orthopets decided to complete the process free of charge. It was the first time they’d fitted an animal with a complete set of new legs. Now, Naki’o is able to run, jump and play just like other dogs, thanks to the second chance his new set of legs have given him. Inbreeding is bad. It increases the frequency of homozygosity for deleterious traits. There’s this little thing called pleiotropy. Selection is a powerful tool, but traits can have multiple effects, and extreme selection for peculiarities can have unpleasant side effects — you may think a pug’s curly tail is adorable, but it comes with all kinds of spinal ailments. And cute little doggies with cute little heads may have skulls too small for their brains, leading to syringomyelia. If you’ve got an hour, this video is worth watching. Add pedigree dog shows to puppy mills as examples of animal abuse. Warning: there are scenes of dogs in extreme pain and distress here; not because anyone is directly harming them, but entirely because they’ve inherited a suite of damaging genetic characters that make their lives a misery.